OXFORD, Miss. 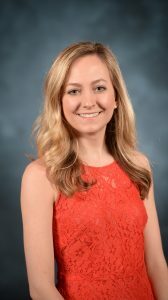 – Mallory Pullman, a third-year student pharmacist at the University of Mississippi, has been named a 2018 Walmart Scholar by the American Association of Colleges of Pharmacy Walmart Scholars Program. A native of Pearlington, Pullman said she is honored to be selected as a Walmart Scholar. “This distinction is motivating and validates my passion to pursue a career in academia,” she said. This is the 10th consecutive year that a student pharmacist from UM has been named a Walmart Scholar. Ole Miss students have received this scholarship 12 out of the 14 years it has been given. Walmart Scholars are named in conjunction with a faculty mentor who has encouraged the student throughout their pharmacy school career. Pullman’s mentor is David Colby, associate professor of medicinal chemistry at the School of Pharmacy. Pullman, who plans to pursue a doctorate in medicinal chemistry, completed research in a natural products chemistry lab in the School of Pharmacy from 2014 to 2017. She conducts research in the UM Medical Center’s Department of Physiology and Biophysics and has presented seven posters on her research projects. The scholarship covers travel costs to AACP’s annual meeting. Pullman said that attending the meeting in July will help deepen her knowledge of pharmacy education and provide her with opportunities for preparing to one day join the faculty of an academic institution.